In the years that have passed since 2009’s Sao Paulo Deadstring Brothers made the move from Detroit to Nashville. It’s a move that makes sense for band leader Kurt Marschke, who has written material that pulled from country, rock, and blues since creating the group in 2003. This year’s Cannery Row reflects the move to Nashville as the country elements have been upped even further. But this album is still rock at its core, and while it takes a bit longer to sink in than some of the band’s previous efforts once they do listeners will find themselves wanting to come back and continue discovering more. 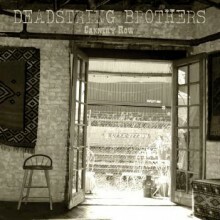 Compared to what I remember of Deadstring Brothers’ previous efforts, Cannery Row seems a lot more laid back. While there are still numbers where the instrumentals head into an up-tempo rowdier sound that is reminiscent of what they’ve done before, the majority of the release has a mellower, sprawling feel where the melodies take over. The overall style that the band pulls from is more of a country/folk rock mix this time around, and while some of the blues and Detroit influences still break through from time to time I hear a good deal of Nashville influence shaping the ideas. I must admit that because of the mellower approach, it took a couple of songs before the songs really started to click. But once everything fell into place the hooks were more immediate, and Deadstring Brothers’ ability to seamlessly blend all these different styles together still works to their advantage. After giving this one many spins some of the earlier tracks still sound a bit too similar to one another, but there is still plenty of numbers that make a stronger impression to make up for it and there are plenty of subtle nuances for listeners to discover over time. The musicians and singers backing up Kurt Marschke have changed significantly over time, and this time around he has Kim Collins supporting his vocal arrangements. I was glad to see that Marschke enlisted another strong female singer as the interplay between multiple vocalists has always been an element of this group’s material that I really enjoyed. Deadstring Brothers still has a rawer feel to their performance, as the pitches of both singers have a grittier edge that is well suited to their overall style. While Marschke remains the band leader, it doesn’t feel as though he dominates Cannery Row and is happy to hand the reins over to Collins on occasion. Despite the lineup changes, the vocals remain one of the strongest elements of the group’s material and the grit of the performance makes it feel as though they really understand these musical styles in and out. A few of the earlier mellow numbers didn’t quite stand out, but Deadstring Brothers hit their stride a little later on and the rest of Cannery Row is able to stand out with a balance of introspective numbers and up-tempo arrangements. It’s clear that the move between cities has brought a whole slew of additional influences but hasn’t taken away the style the band was known for in the past either. I would like to see the group develop the more spaced out melodic numbers a bit more, but as a whole their latest effort was still an enjoyable listen and fans of country and folk tinged rock ‘n roll should find it to be a worthy addition to their collection.